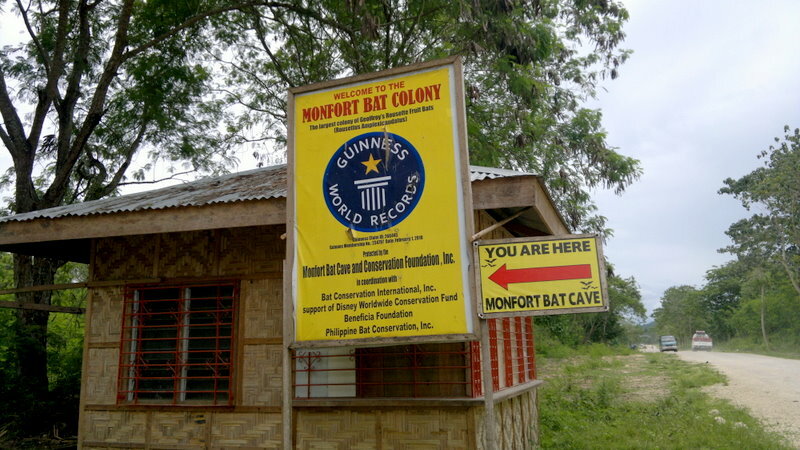 Monfort Bat Cave is the world’s largest colony of Geoffroy’s Rousette Fruit Bats (Rousettus Amplexicaudatus) with an estimated 1.8 million bats living in the five remaining caves of Samal Island, to a density of 645 bats per square meter. 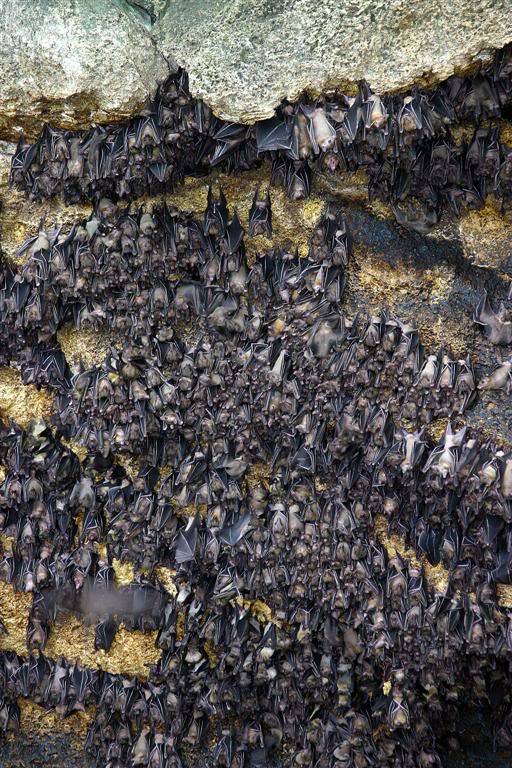 This distinction was entered into the Guinness Book of World Records as the biggest colony of Geoffrey’s Rousette Fruit Bat in the world. 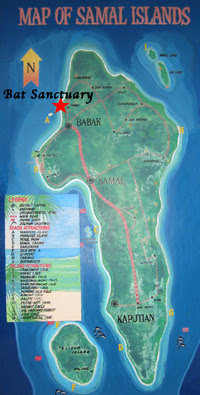 The colony is situated in a 23 hectare protected area of the Monfort Eco-Park at Barangay Tambo, Babak District, Island Garden City of Samal, Davao del Norte, on a property owned by Norma Monfort. 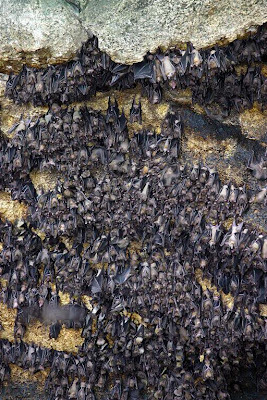 There are about seventy caves in the island which used to be inhabited by these fruit bats, but, sad to say, have now remained empty due to irresponsible hunting and destruction of their habitats. 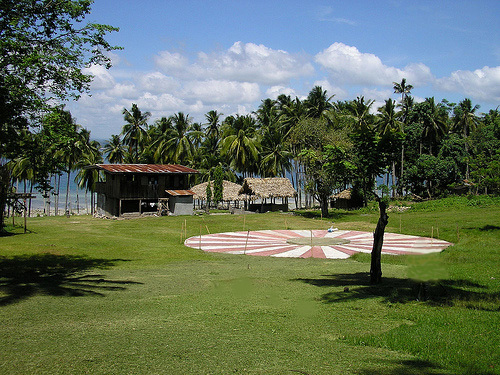 Had it not been to the intense conservation efforts of Norma Monfort, the owner of the property and current trustee, together with the support of the residence and the local government of Samal, and in collaboration with several key organizations, the colonies might have been totally destroyed. 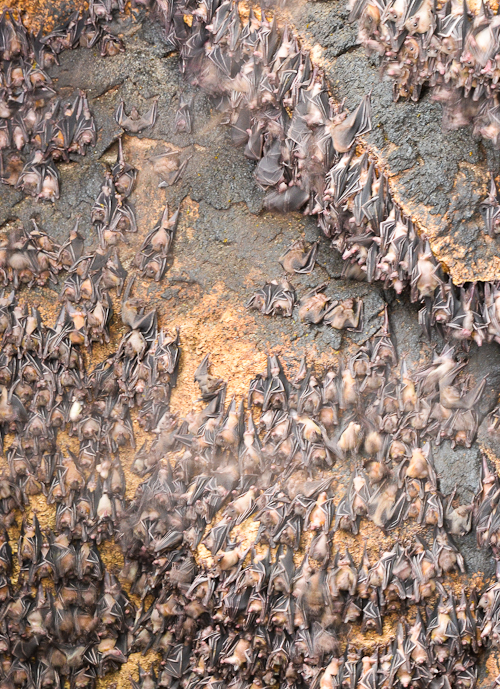 The bats and their colonies are now under constant protection. 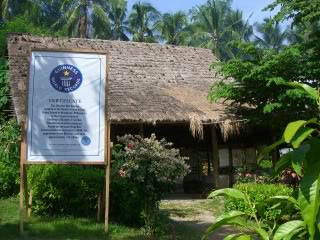 And, in June 2006, a Declaration of Understanding was signed by Monfort Conservation Park, Bat Conservation International, and several key organizations such as the Department of Environment and Natural Resources, the local government of the Island Garden City of Samal, Kinaiyahan Foundation, Inc. , Peace Republic, Inc., and the Foundation for the Philippine Environment, to facilitate the long term protection of the colonies. 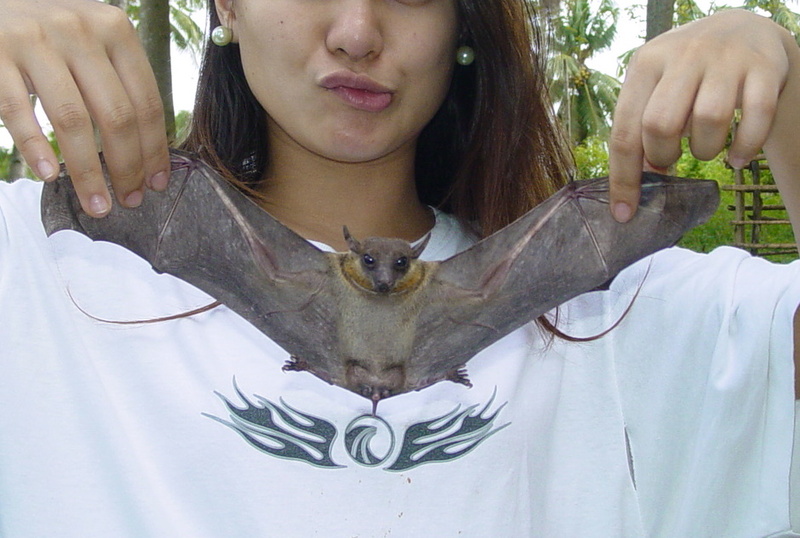 In January 2007, Norma Monfort, together with a group of local conservationists and Bat Conservation International scientist, Dr. David L. Waldien, established the Philippine Bat Conservation, Inc., a non-governmental organization that facilitates and leads regional conservation of bats and critical habitats through specific action-oriented partnerships, and conducts conservation, research, and education activities at the Monfort Bat Cave which was established to act as a national model for bat conservation and management. 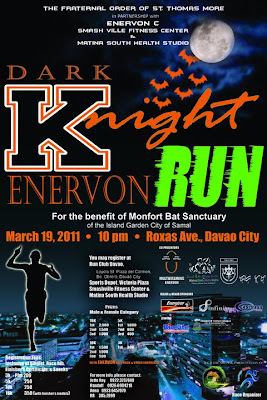 (L-R) SM City Davao's Brand Manager Jay Madulara, Asst. 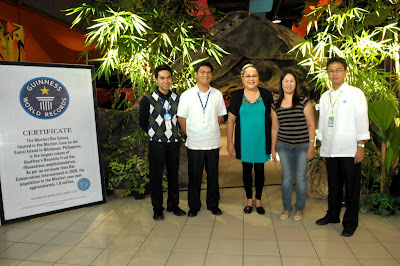 Mall Manager Cesar Cachero, Philippine Bat Conservation, Inc. Executive Director Norma Monfort, , RPAO-DENR XI Chief Dr. Rita Fe Sison and EMB-DENR XI Environment Specialist Engr. Nestor Patnugot after SM hands over the 10 MM sign-ups to DENR XI. 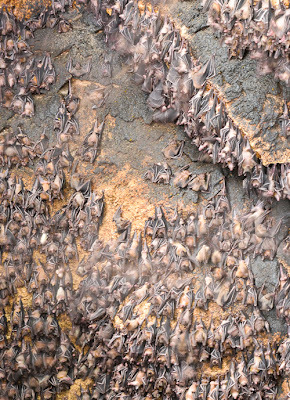 Behind is a replica of the Monfort Bat Cave. 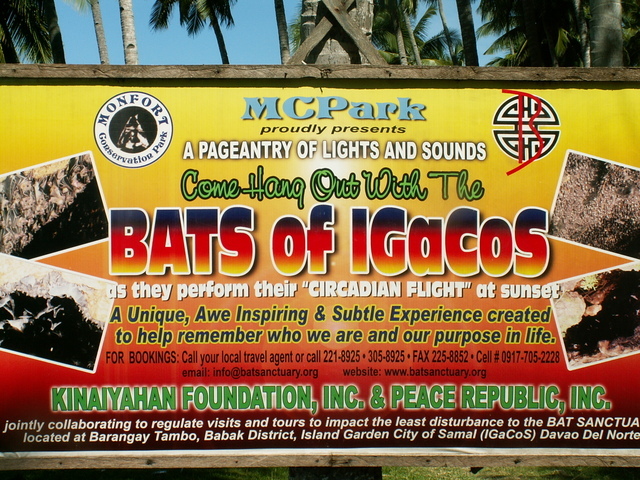 On April 20, 2007, Mrs. Teresita B. Antalan, accompanied by the Honorable City Mayor of Island Garden City of Samal (IGaCoS), Rogelio Antalan, and assisted by Dr. David Waldien of Bat Conservation International, did the honor of cutting the ribbon during the official opening of Philippine Bat Conservation, Inc,’s outdoor educational exhibit entitled, "The Wonders of Bats". 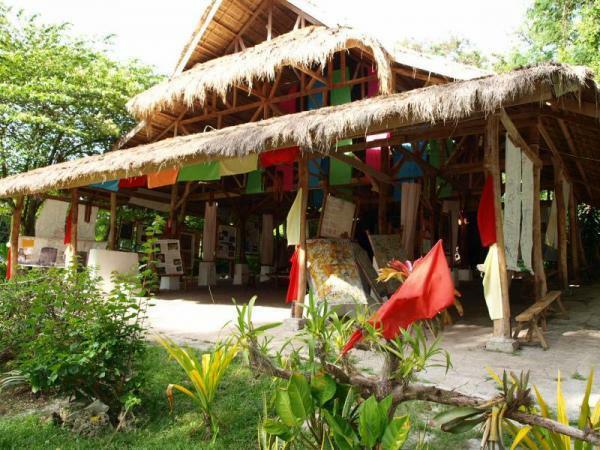 The event was jointly hosted by Philippine Bat Conservation and the Monfort Conservation Park, and was widely attended by various government and non-government organizations, local barangay officials, and guests from both the business and private sectors. 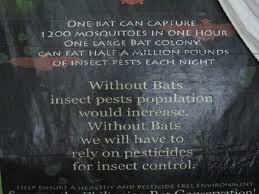 The Exhibit is now a permanent fixture at Monfort Bat Sactuary. The Guinness Book of World Records award to the Monfort Bat Cave as the biggest colony of Geoffrey’s Rousette Fruit Bat in the world was given last February 2010. 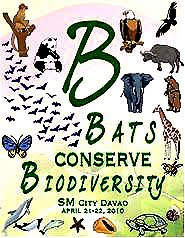 The awarding was the highlight of the Eco-Conservation Fair held at SM City Davao Event Center last April 21 to 22, 2010 under the theme, “Bats Conserve Biodiversity”. The event was in connection with the Earth Day Celebration. Tau Mu fraternity of the Ateneo de Davao University College of Law organized a fun run called, "Dark Knight Enervon Run" last March 19, 2011 for the benefit of the Monfort Bat Sanctuaty. Ms. Norma Monfort is now conducting conservation lectures and seminar workshops together with local experts and members of the Bat Conservation International which Ms. Monfort co-founded. 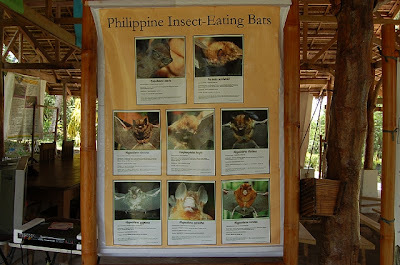 The Philippine Bat Conservation, Inc, is a non-profit organization which aims to conserve and protect the local bat species and their habitat, to provide a place for ecologically safe and responsible bat research, and to educate visitors and the general public through programs about the benefits of bats on the surrounding ecosystems. 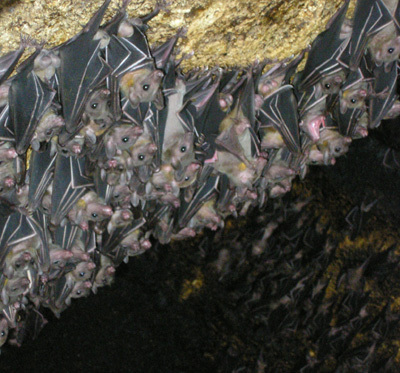 Bats are important to the general health and existence of the rainforest: more than 70% of the trees in the rainforest currently exist because bats pollinate, distribute seeds and eat otherwise harmful insect pests. Bats are good pollinators: they pollinate flowers, and spread seeds for fruits, and they are said to be the main reason on the abundance of Durian fruits in Davao City. 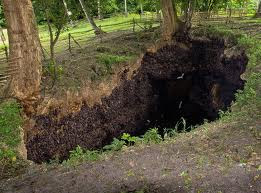 Bat manure which is known as guano is one of Mother Nature’s most effective natural fertilizers. 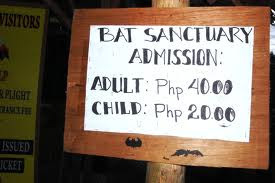 A kilo of guano is sold at a price of $200! 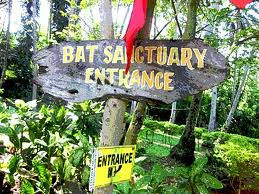 Become a Bat Sanctuary Volunteer! 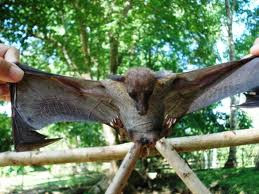 One insect eating bat will eat almost its own body weight in mosquitoes and other insects every night! The sanctuary is only a few minutes motorcycle ride from Babak pier. 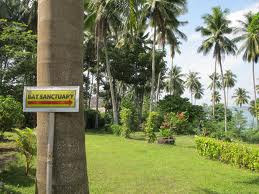 The park has a couple of rooms for rent (Php 600/night or about USD$30) for overnight stay. Contact number is +63-84-3031915. There is a camping area right across the park with a great view of the beach and Davao Gulf. 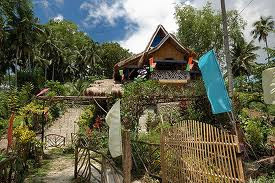 There are open cottages for rent too. 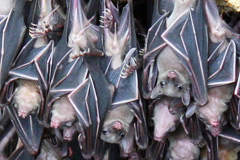 I love bats a lot man. 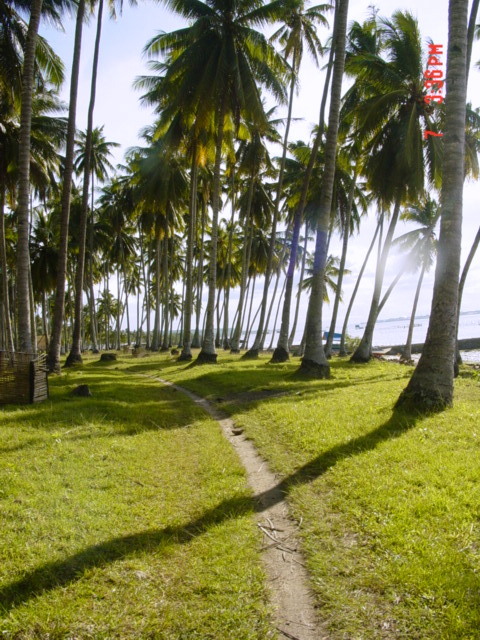 Same here, brother! 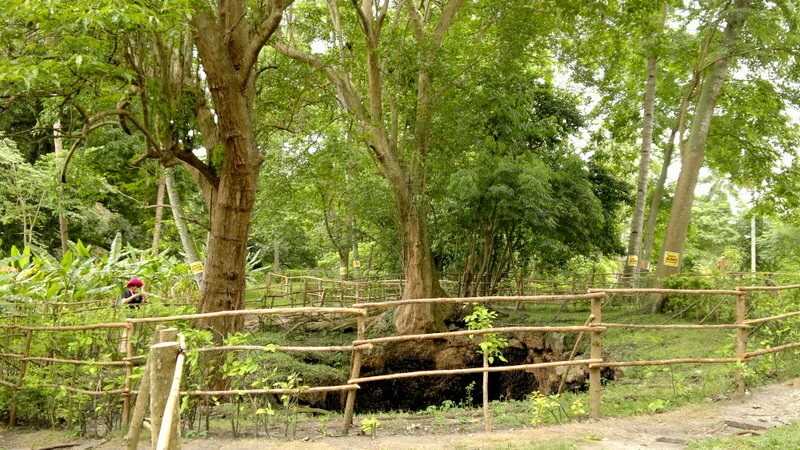 Thanks for dropping-in and for your comments. Please follow my blog for fresh posts and updates. 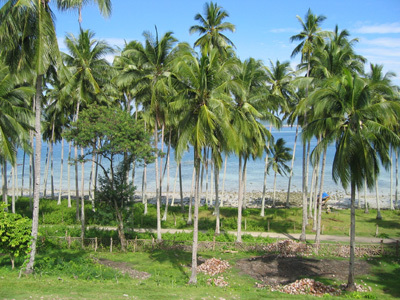 Thank you iwannagotravel, drop-in some more for fresh posts and updates. is it possible to visit monfort around sunset when the bats fly out? 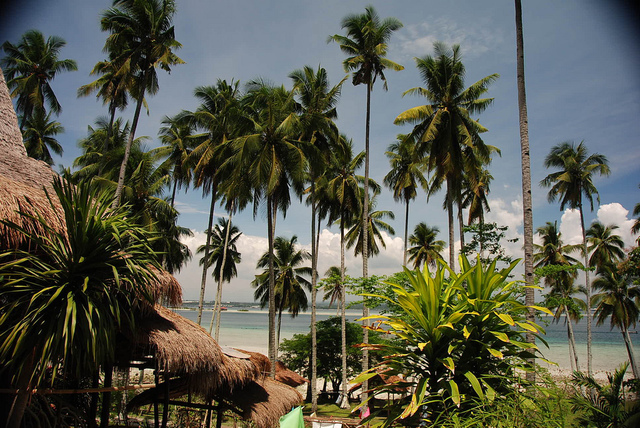 also, are there still boats returning to davao city after sunset, or do all the boats have to be docked at the wharfs by 5pm?